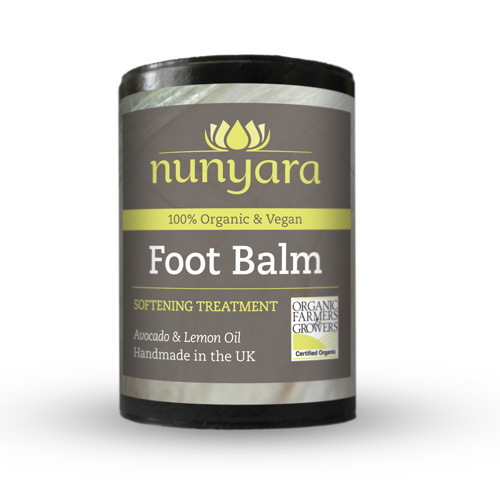 A wonderfully rich foot salve with organic avocado, lemon oils and shea butter. 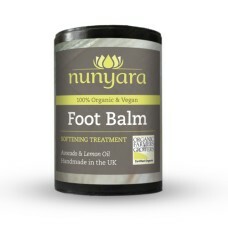 This foot balm is particularly suited for those that have minor foot complaints and rough sore feet. The lemon oil is added to relieve chilblain pain. The avocado oil is very rich and softening for rough and chapped heels. Anyone! Best used after exfoliating, and just before bedtime. A soft buttery scent with a fragrant lemon overtone. So good, it smells good enough to eat! Apply a small amount to the feet and massage in, it is a balm so a little goes a long way. And be careful when using oil based products on slippery surfaces. Ingredients;Olea europaea (Olive oil)*, Persea gratissima (Avocado oil)*, Carthamus tinctorius (Safflower oil)*, Copernicia cerifera (Carnauba wax)*, Butyrospermum parkii (Shea butter)*, Citrus medica limonum oil (Lemon oil)*, Limonene**, Citral**, Linalool**, Geraiol**. * = Organically produced. ** = Occurs naturally in organic essential oils. This Product is Vegan Friendly. As Always Totally 100% organic.